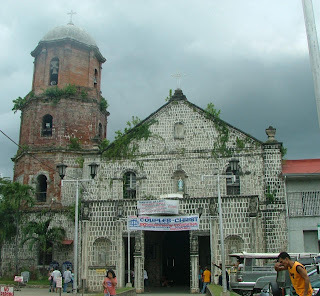 This is the Immaculate Concepcion church in Balayan, Batangas. I was here a couple of weeks back to visit my relatives. 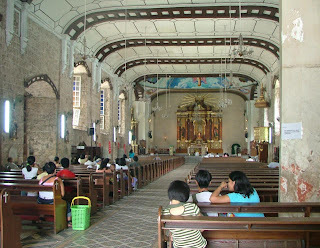 It's standard for us to visit the town church. Here, I took a picture of the church in all its glory. Too bad there were some "unglorious" moments captured as well. The lady in pink was scratching her nose while the guy in orange was blowing his nose. Oh well, let's visit the inside. 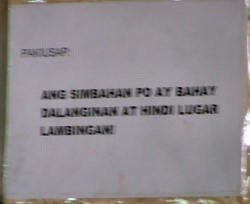 It says "Ang simbahan po ay bahay dalanginan at hindi lugar lambingan". (The church is home for prayer and not a place to be sweet with someone). I wonder just how many couples have they caught to have reason to post this.